pavan, 30 Jan 2013any 1 can tel me this mobile support mp4 and avi video pls ans meYes but depend on screen resulation. jeff, 24 Jan 20131. Once you open the box, throw the headset the comes with it, sound coming out of it is very ... moreJeff, what type of earphones are you using now? I also have the problem with the soft sound coming frome earphones when playing music of listening to radio. Other earphones only let the sound come from one of the two earphones. Any suggestions? friends can you tell me about its net speed and price and also about touch..?????? When using other earphones, other than the Nokia ones that came with the box, does the sound only come out of one earphone? I tested several other 3.5mm jack earphones and sound only come from one earphone. The sound from the Nokia earphones are so soft. Any suggestions on what earphones to use? I want to know about it's touch....plz any one tell me about it touch.it is good Or bad.plz help of friends. sizwe, 18 Jan 2013does the nokia 306 asha support whatsapp?Hi Sizwe, yes it does and very nicely too. where can i find notifications on facebook app on this phone? can anyone tell me? 1. Once you open the box, throw the headset the comes with it, sound coming out of it is very muffled as if you were covering it with your finger. 2. Alarm volume is low, even after you have set your phone to full volume. 3. Calendar alarm doesn't have snooze function. it will only sound the alarm once and that's it. 4. Doesn't have a lap timer app out of the box, though you can download a third party(offscreen tech) lap timer from nokia apps store. Anonymous, 20 Jan 2013Yes this phone support whatsappwhat about skype??? can anybody please tell me does it or any of nokia asha series support smart movie player ? 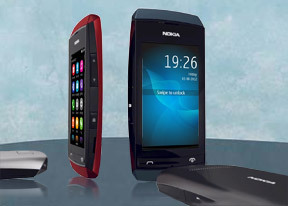 does the nokia 306 asha support whatsapp? does this phone support reading doc-files ?